Human bodies are an ingenious but strange design solution. Not fast by animal standards, but we cover the ground well. We have above-average vision, good climbing abilities and excellent fine motor skills. One thing we’re actually not very well designed for is sitting. In fact, one 2012 study suggests sitting for extended periods is more damaging to your health than smoking. A hundred years ago, this wasn’t so much of a problem. Most of us spent our days rivetting ships, toiling in fields or striding a delivery route. Unfortunately, as desk jockeys and code monkeys, we spend most of our waking hours in front of a computer by necessity. Comfortability is very subjective, but there are some more or less universal ergonomics rules how to arrange your work environment to reduce trauma and increase productivity. Ergonomics is a relatively modern term – it was first used in 1949. It comes from the Green “ergon,” (work) and “nomoi” (natural laws). 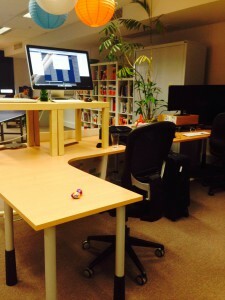 Ergonomics is essentially usability, so it should naturally resonate with designers. 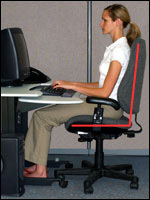 The purpose of ergonomics is to increase your productivity and to keep your health. In some countries, legislation makes it mandatory for employers to ensure ergonomics in the workplace, but this isn’t the case everywhere. Workplace ergonomics is a big topic, and I’m not a doctor or ergonomics consultant. But I can give you a hit-list to target some of the biggest issues: desk & chair, monitor, mouse & keyboard, and miscellaneous. Obviously you’ll need a desk you can regulate the height of and a chair that has an adjustable backrest to provide support for the lumbar area. Your back is the main concern here, but incorrect posture could injure other parts of your body as well. For instance, feet that are not at 90 degrees, can lead to knee problems. This happens most often when taller workers don’t have enough room under the desk for his or her feet to rest naturally. Arm and neck position are also important. The neck should be straight vertical and not bent down or back. The arms should be in-line with the body, the forearms at 90 degrees from them. The wrists and fingers shouldn’t be bent down, up, or sideways. The classic upright setup (#1) is recommended as best, but for many of us it’s less comfortable than a reclined setup (#2) or standing. Personally, I’ve found setup 3 strains my back less, but the distance from the monitor (when there is no monitor arm) becomes a problem. If you are working from home, you can work straight from the easy chair but in this case the monitor, mouse, and keyboard are a problem because usually there is no suitable place to put them. The easy-chair setup works best for laptops where all the parts are together. Laptops are an ergonomics disaster in their default configuration, but you can use various stands to improve the angle of the monitor and the keyboard. Standing desks have gained a lot of momentum over the last 5 years — and with good reason. Though they always require an adjustment, their benefits in just extra calorie burned are significant. 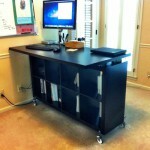 Now, if cost isn’t a concern, the Up Desk might be your best option. It looks amazing, is power-adjustable and, like an expensive Audi, even remembers your favorite settings. Cali Lewis demonstrates its wondrous beauty here. But, let’s face it: cost IS a concern for most of us, and convincing your boss (or partner) to drop $2,000 on an office desk is no mean feat – particularly if you might not have convinced yourself yet. Thankfully, many intrepid geeks have ‘IKEA-hacked’ their way to standing desk nirvana for less than a few hundred dollars. Tim, Prem and Alex from the Flippa.com team use a stacked coffeetable arrangement to give themselves standing desks that can revert to a seated arrangement quickly and easily. The small tables were $50 each. Jason from Atlanta built this very slick construction using a set of cheap and ubiquitous IKEA Expedit shelves as his base. He also employs old CDs to raise the desk surface to the right level. In addition to getting a quality monitor with a good picture (fortunately CRT monitors are history for years now! ), a monitor arm to regulate the vertical and horizontal position of the monitor (height and distance from the eyes) is another ergonomics recommendation. Of course, you can do without a monitor arm. A couple of bricks or a few sturdy books will do — I’m sure we all have a few old tech manuals we don’t need. Lift your monitor up to center on your natural eye-level. This prevents the shortening of the scalene muscles in the front of your neck, which in turn prevents you from hunching. Regardless of the quality and ergonomic purity of your monitor, the best gift for your eyes is not to stare at the monitor all the time. Look away from your the monitor in those moments when you are thinking, and get up and go for a wander at least every hours. Non-ergonomic mice and keyboards are responsible for all sorts of wrists, fingers, and forearm injuries. Fortunately, there is a lot you can do to make your mouse & keyboard as ergonomic as possible. Firstly, if your desk is high enough, you might want to get a sliding keyboard tray — though not everyone is comfortable with this. Secondly, there are ergonomic keyboards, such as the (successors of) Microsoft Natural Keyboard that open your wrists to a more relaxed position. You could also consider a split two-piece keyboard like the Ergodox. Ideally you should also learn to type with ten fingers. This will reduce the number of movements your wrists and fingers make. One approach that works for me is choosing a keyboard without a number pad. I enter numbers only occasionally and the numbers pad isn’t of much use to me. When it’s gone, the mouse gets closer and I don’t have to stretch my right arm. Another worthwhile tactic is to learn to use a mouse with both hands and switch them. This isn’t as difficult as it sounds. I’ve done it from time to time, especially when the setup was more comfortable for a left-hand mouse. Precise movements (like dragging a shape in GIMP or Photoshop) are more of a challenge, but they are not impossible to master. Lighting. Proper lighting is especially important to protect your eyes. Lighting must be sufficient to light the monitor and the desktop surface but it should neither be too bright, nor fall directly on the monitor (because this causes reflections that further strain your eyes). Luminescent lighting is an eye killer but if your office uses it, I’m, afraid there isn’t much you can do. Get/stay fit. When you have a stronger core, you’ll always have better posture and fewer back problems. 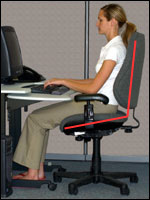 You also tire less easily, which reduces slouching and bad body positions. Clothes. Developers and designers tend to wear casual clothes at work and this is not because they lack taste in clothing. T-shirts, loose tops, jeans are much more comfortable to work in than formal wear. Clearly, if your job requires you to suit up, do it, but put some thought into getting well-tailored shirts that aren’t tight or restricting at the shoulders or forearms. Cut the time you spend in front of the computer. 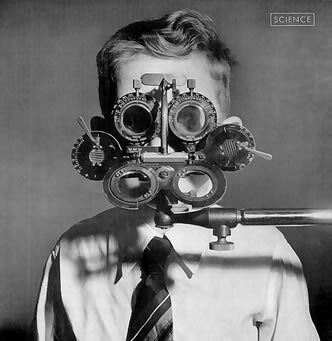 This is the best solution to your problems with eyes, wrist, back, etc. but unfortunately, it’s next to impossible to achieve. Anyway, if you can spend less time in front of the computer, don’t miss any opportunity to do it. 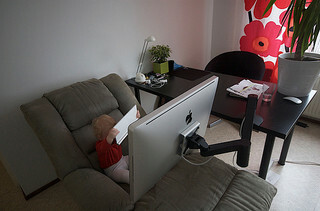 There is really a lot one can do to make his or her place ergonomics-friendly. For instance, this checklist lists many items to check and optimize. However, very often we’re not in a position to apply all these rules. What’s more, it’s likely you won’t need them all. The best you can do is not to follow rules blindly. See what works for you and apply it. Ergonomics is both universal and individual. What works for one person doesn’t necessarily work for others. 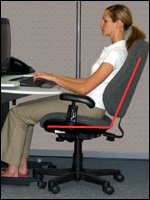 I’d love to hear some of your personal ergonomics tricks. It might take some experiments to find the optimum solution but don’t give up – try to find your personal ergonomics heaven!